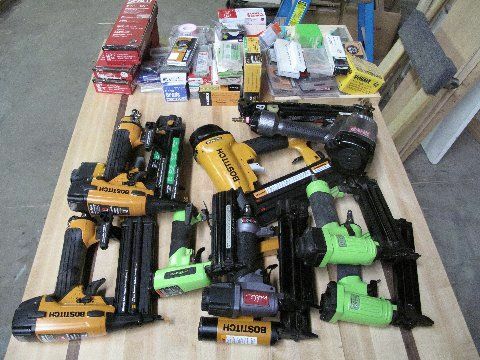 First I like to get my thoughts running by getting some lumber ready and in this case a cabinet for some of my nail guns grouped together and vision what I will need for room and what exactly I am trying to achieve. 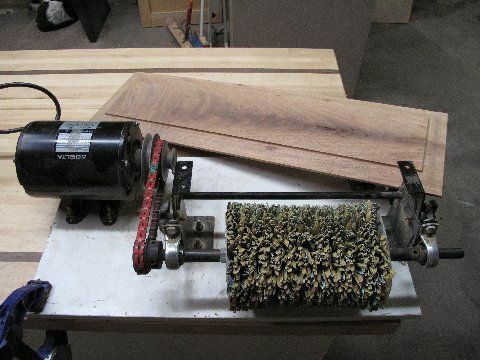 Just like the Drill Bit cabinet I got what I wanted to put in it rounded up and well you get the picture. 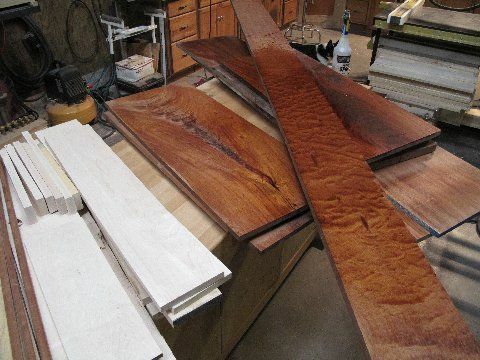 Hard Maple, Africian,Santos,Quilted Mahogany’s….. Having 2nd thoughts on using the quilted…. 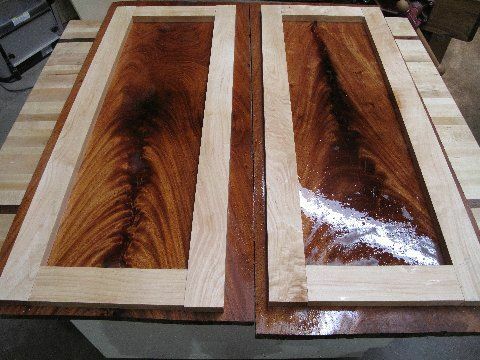 Also several Mahogany crotch panels….. Purchased a bunch of these Mahogany crotch panels about 5 years ago and figured about time to use some of them. I paid about 25 bucks a panel…... and I did get about 45 of them. Good Deal? I think so. Of course we all know these type of panels do have some cracks so I will work around that the best I can. 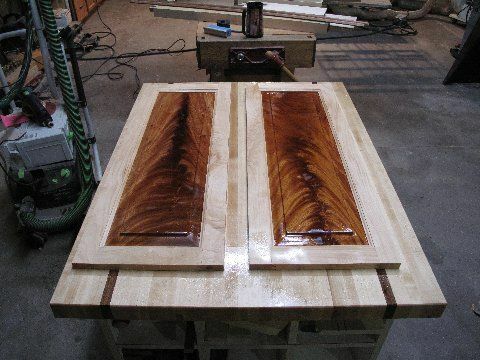 I layout my panels and right now the rails and stiles are not machined yet but this give me a visual of how I want to center the panel on each door. Mineral spirits to give some idea what to expect…. 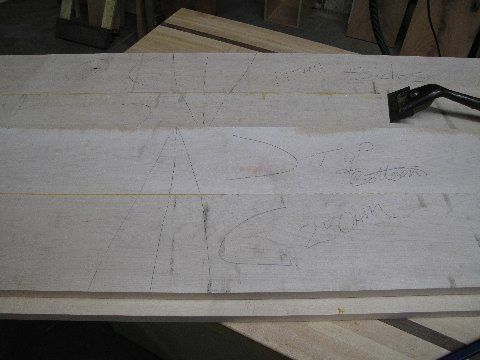 The sides,top and bottom I know for sure I want to contrast with hard maple so I go them glued up… If your woundering I put the funny c’s to remind me how the grain is going. 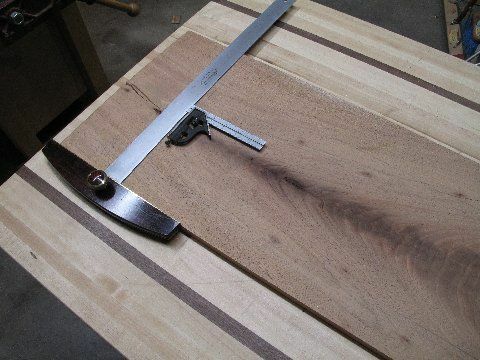 Best to alternate grain when glueing panels and I will usually note time on panel when it is glued up so I know how long they been on the clamps. Now I am ready to do the rails and stiles. Always best to cut all the rails and stiles at the same time. Here is a Hawk Panel Master. I love this machine. It took about 8 min to do them all…. Rails and Stiles are done and layed out on the panels I want to use. 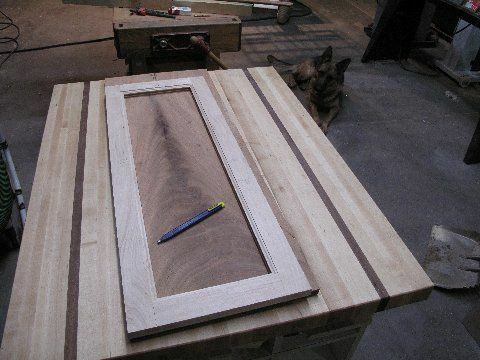 After I get them centered on the panel, outline the center opening, I add 3/8” all around for the groove allowance. A tad wider but It gives me a little to play with later if need. Then I can downsize the panels and get them ready for the Hawk…. Marking the 3/8 needed for the panel tongue. Panel Master again just turned around. Only weakness with this machine is not enough side support when doing panels so I use the trusty Micro-Moose clamps for support and stability…. 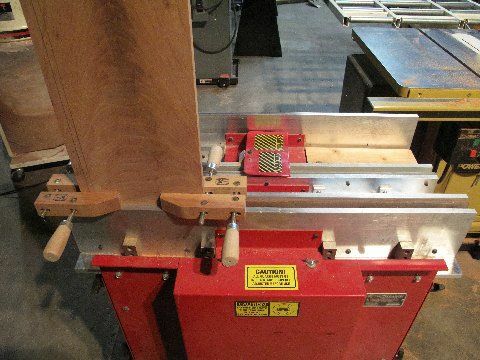 By the way these clamps are great and made in Iowa…. 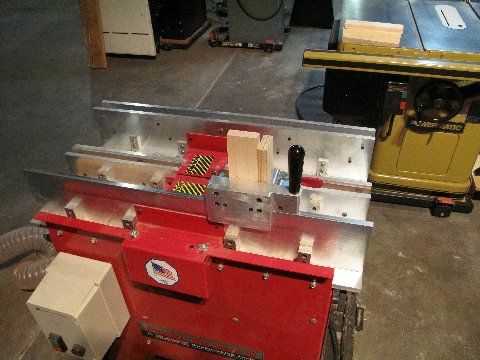 I am a big fan of American Made Tools….. Tokk about 5 min to do both panels…. Well here is the Dreaded Quality Control check…. I passed… so far so good. 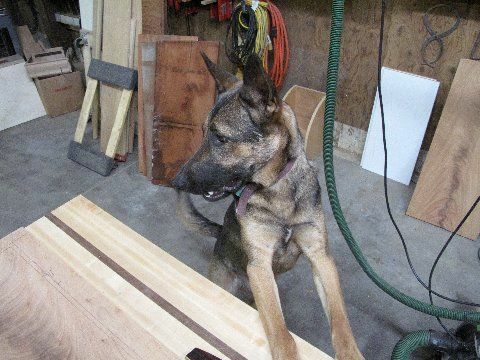 Only took 3 Milk Bones to get QC off my back…..
Dry fitting the panels, so far so good….. Gotta buy more Milk Bones…..
After a light sand on the edges I will usually grabb this profile sander/mop sander and it works pretty darn good…..
Well end of Part 1….. before I do part 2 I gotta go get some Milk Bones…. Gotta keep QC happy then I will add the rest of the story…. I will be keep up with this series. I need to build something to corral my air tools. Beautiful panel and great QC inspector. Very cool! Thanks for the details! I love crotch wood. It is very beautiful! I have never seen that Hawk tool before. That looks like it really makes doing panels fun!